The day was just perfect. Mid 80’s, with a high sky and low humidity. It was a day built to be outside. The initial errand running combined with necessary yard work easily gave way to a late afternoon beverage, in this case, a lemonade beer. 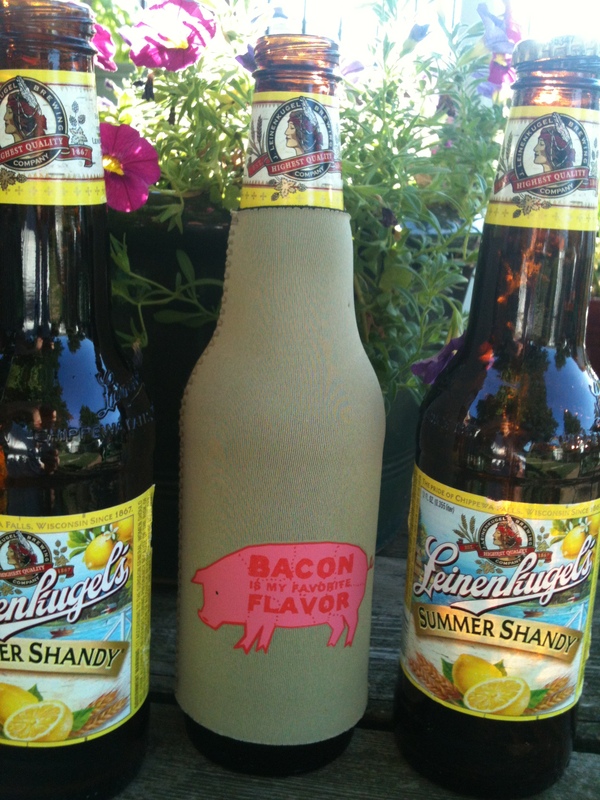 A Leinenkugel Summer Shandy to be exact. It was then, while enjoying this refreshing beverage, and by no coincidence at all, I might add, that the voices started. The low, almost desperate call that immediately garnered my full attention. It was my pit, meaning my barbecue pit. It’s almost always my pit. “Feed me”, it moaned. “Feed me. Something. Anything”. Of course I will. This type of day is begging for a little evening grilling. It will be a very sweet conclusion to a great day. “But what to make on this short notice”? I asked myself. Thankfully, these type of decisions do not deter my wife, and because they do not, she fancied a menu that was fit for this fine summer evening. 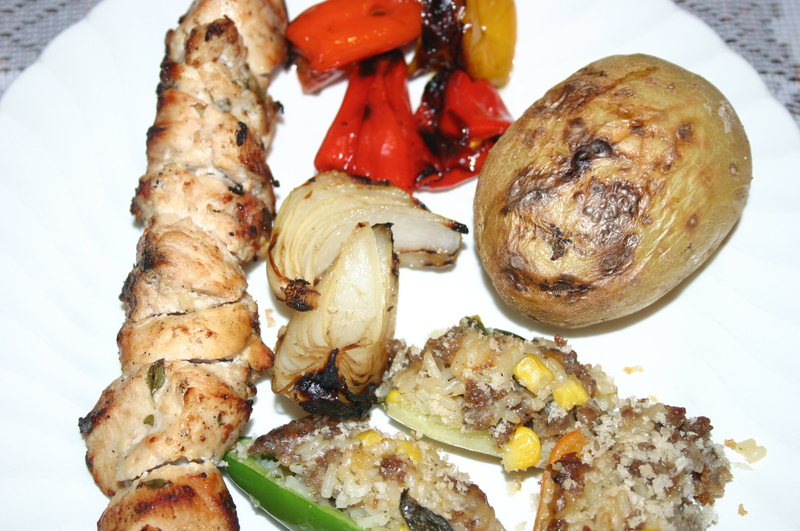 That menu consisted of lemon pepper chicken kabobs, made fresh with our homegrown herbs, along with stuffed peppers, both Jalapeno and Dancing Spirits, again, from our garden. Add in some grilled sweet onions and a couple of baked potatoes charred on the grill, and what you have there is just a little bit of heaven, which goes very nicely with yet another Summer Shandy. 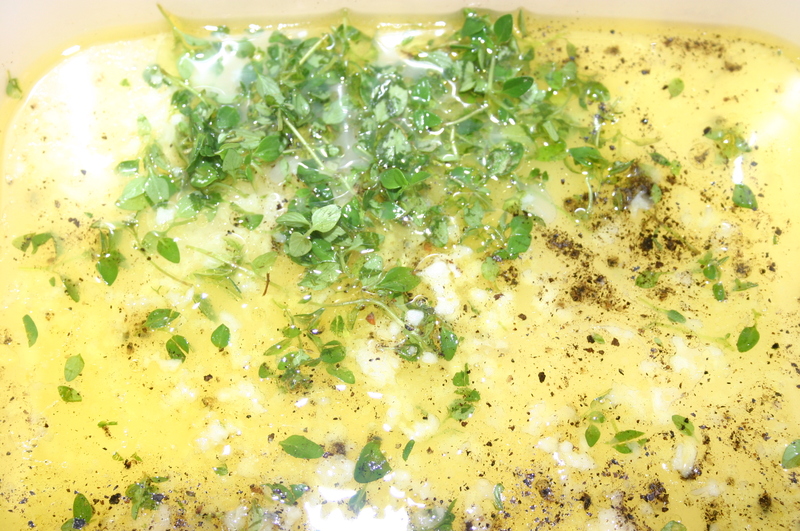 We started with a marinade consisting of lemon juice, olive oil, garlic, lemon thyme (fresh), and fresh cracked black pepper. 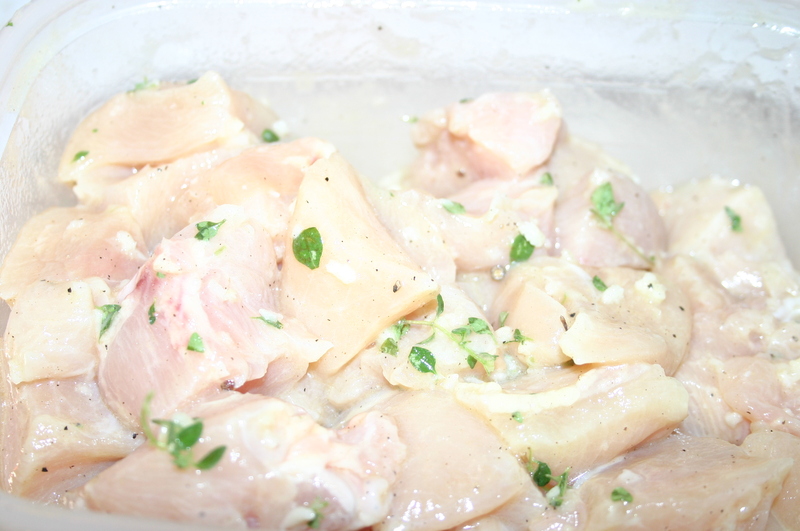 The next step is to cube the breasts, and quite naturally introduce them into the lovely pool of marinade. While these flavors are marrying with the chicken, a terrific stuffing for all the peppers is made by adding ground pork sausage to a bag of Archer Farms Cilantro rice and Vegetables, found at the local Target store. along with a generous helping from a bag of shredded, Mexican four cheese mixture. 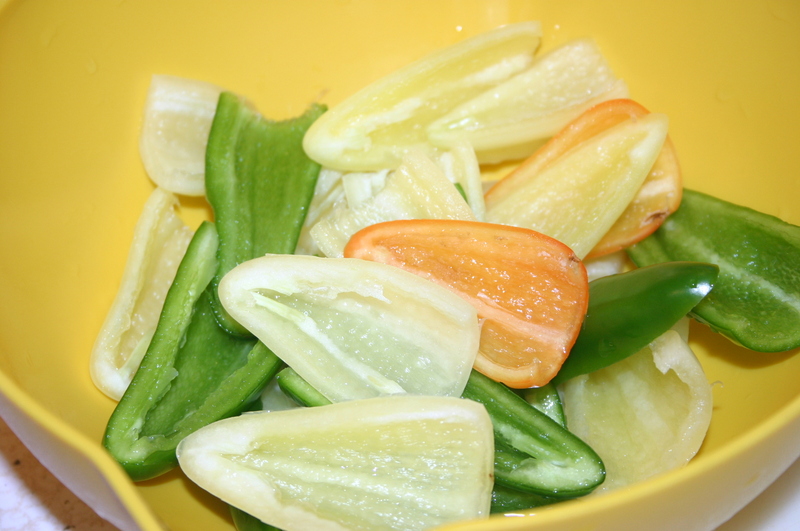 The peppers are halved and the seeds removed. I must add at this point my initial thought was of wrapping these beauties in bacon. That idea was immediately dismissed, and I honestly admit that the final product was in itself excellent, and (gulp), no bacon was actually needed in this rare instance. There, I said it. 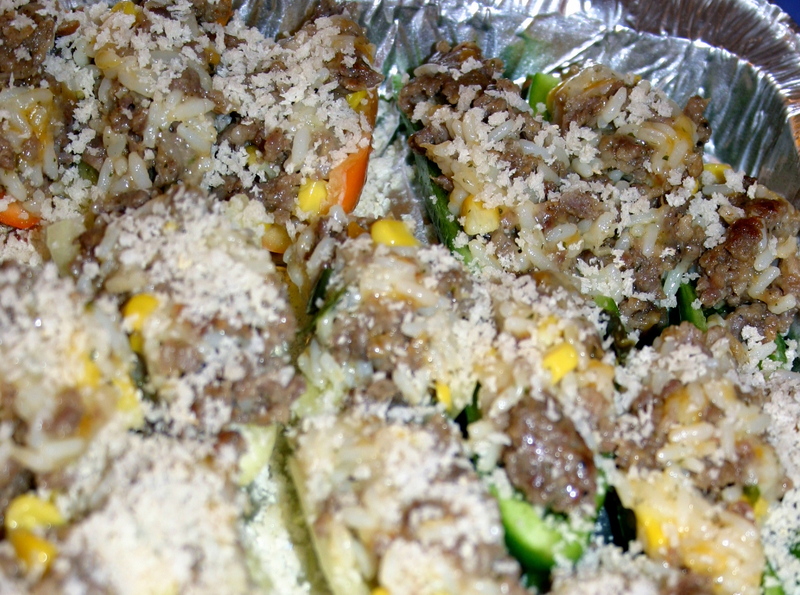 The peppers were than put in a single layer in an aluminum pan and put on the grill, indirect style, opposite from the coals. 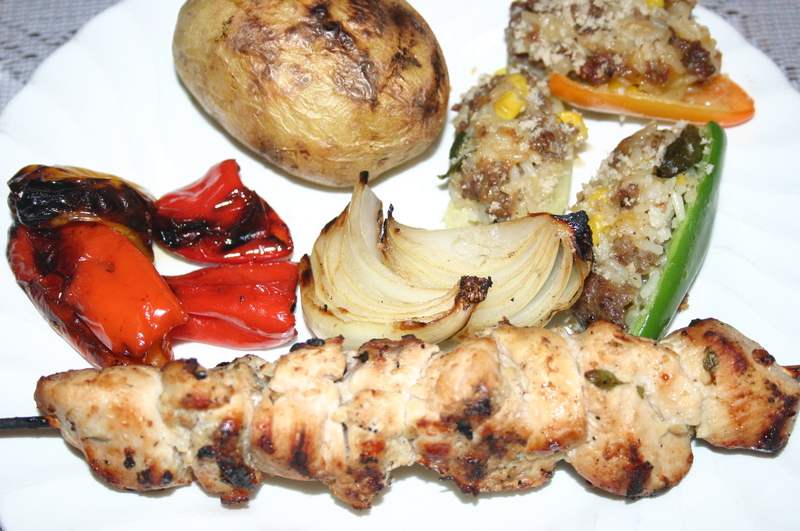 Everything else was the opposite side, grilled over direct heat, including the chicken skewers, small naked peppers, and a couple of skewers of sweet onions. 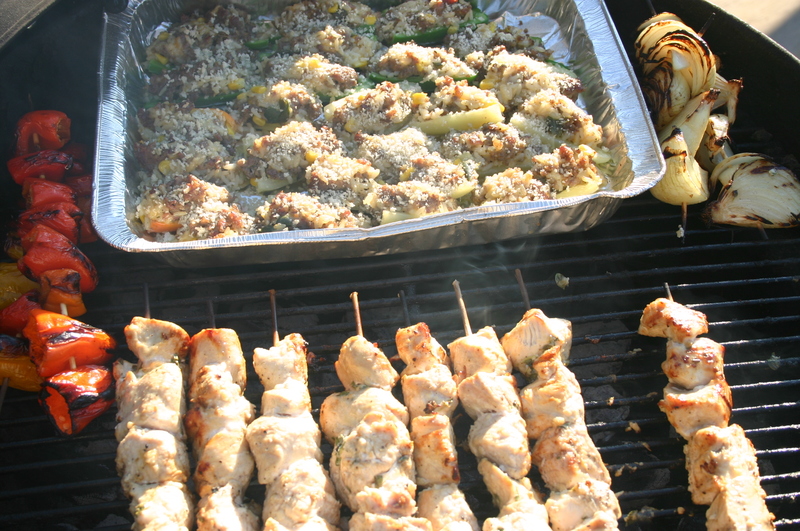 As you can see, this all worked quite nicely to fill the grill. 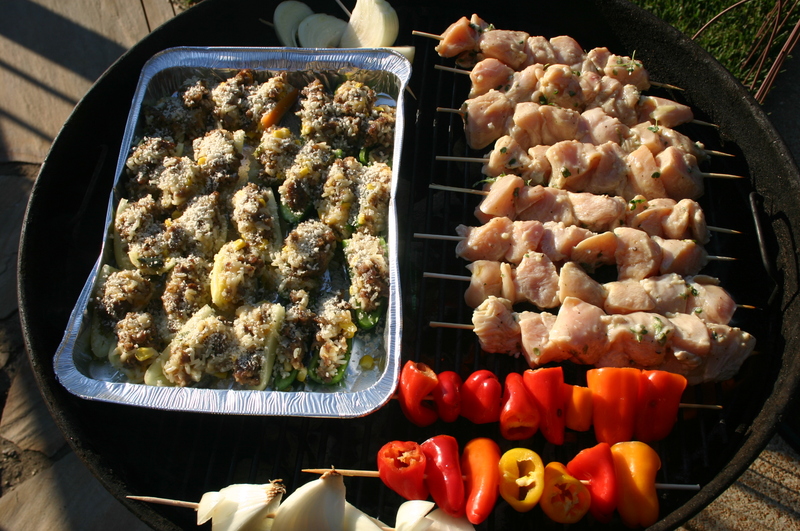 While the stuffed peppers roast away in the swath of hickory smoke, the skewers demand constant attention, unless you enjoy your chicken with that “pencil eraser” texture. And after about fifteen minutes, I turned the pan of peppers, making sure everything cooks evenly. The chicken, after being rotated a few times, started getting that little bit of charring, and all I can tell you, is that whenever my brain tells me, “Maybe just give the chicken a couple more minutes”, I know it’s done right then and there. 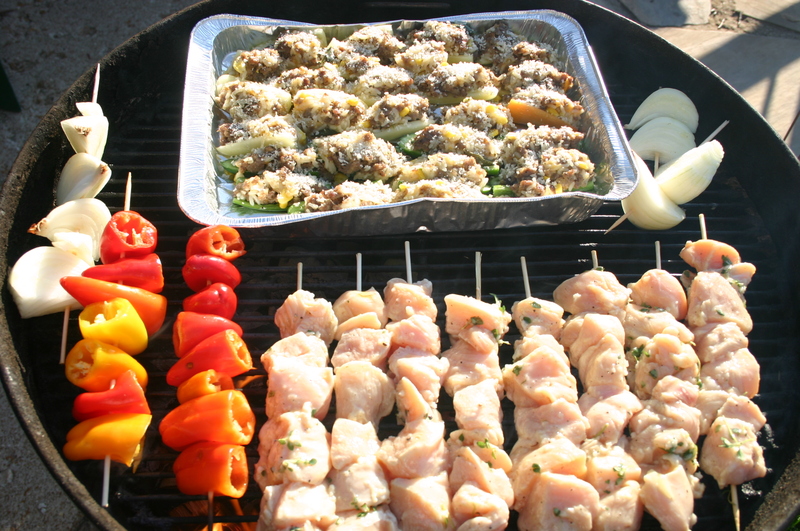 Those extra couple of minutes will cause the skewers to resemble those pencil erasers mentioned above. When all the players are finished, the skewers and pan of peppers are taken off the grill, and that end to this fine day that we started out to have can finally be enjoyed. Thanks, Yeah, food on a stick. how can you go wrong, haha..